You will need git, Node and Expo installed on your machine. Some knowledge of React Native is required. In this tutorial, we’ll be creating a realtime workout tracking app with React Native and Pusher. Basic knowledge of React Native, React Navigation, and ES6 syntax is required. We’ll also be using Redux. I’ll add as much detail as I can on what’s going on with all the Redux code, but you should at least be familiar with how Redux works. It’s always recommended to use the most recent stable versions, but in case the app doesn’t work for you, you can use the versions above to ensure we have the same environment. Lastly, you must have a Pusher and an ngrok account. 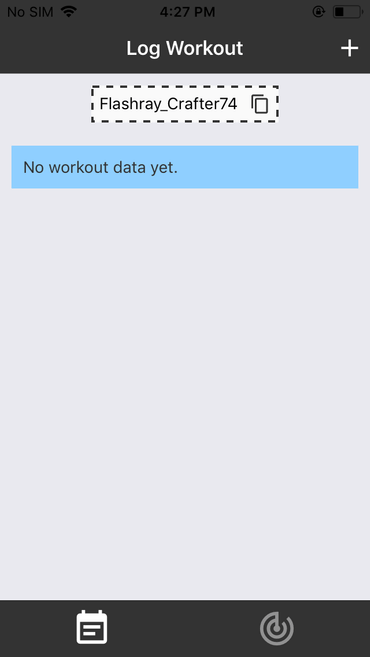 The app that we will be creating is for gym buddies who are working out in a different gym. They can use it to keep track of their buddy’s workout even if they are away from each other. The app has two tabs: one for logging their own workout, and another for tracking the workout of their buddy. 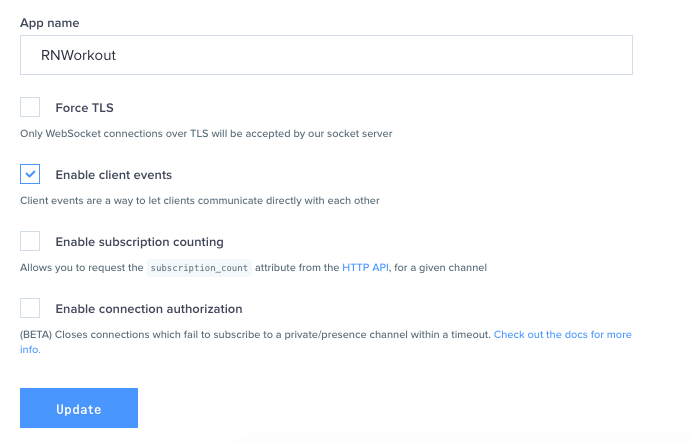 Users can both log and track at the same time. This makes it possible for users to compete on who can make the most number of sets and reps for each exercise they choose. You can view the source code of this app on this GitHub repo. Client events allow us to emit messages directly from the app. Because normally, messages are only emitted from the server. This time, we’ll only be using the server to authenticate the user. This authentication process allows us to make requests directly from the app. The starter branch contains a minimal version of the app where the screens, components, helper functions, styles, and the server code has already been added. This makes it easy for us to focus on the main subject of this tutorial, and that is how to work with Redux and Pusher Channels. The app/helpers folder contains two helper files for generating unique ID’s (uniqid.js) and usernames (uniqname.js). The unique ID’s are used as a unique identifier for the exercises and sets. The server folder contains the code for the server component of the app. This server is for authenticating the user when they initialize a new Pusher connection. No further updates are required inside this folder except for the server/.env file. We’ll update it later once we run the app. The app/modals folder contains the code for the add exercise and add set modals. These modals are used for logging a new exercise and adding a set to a specific exercise. We will be updating the AddExerciseModal.js and AddSetModal.js later. This is to add the code for dispatching actions that will modify the store. 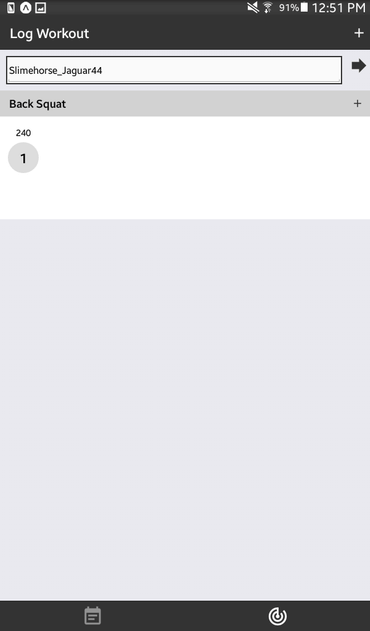 AlertBox - for showing messages enclosed inside a box. IconButton - for showing buttons with an icon in them. SetContainer - for showing the individual sets (the gray circles with a number inside and below them). List - serves as a container list for the SetContainer component. 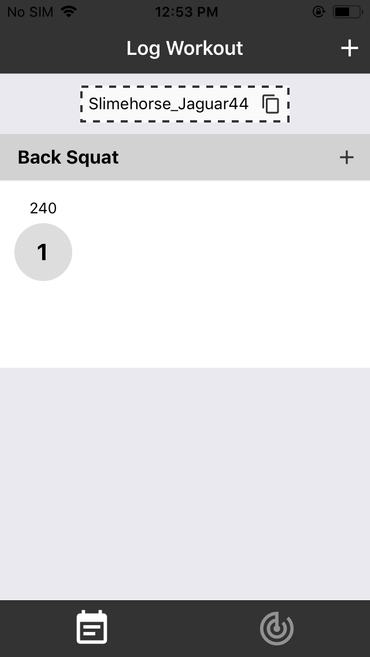 ConnectedFlatList - for showing all the workout data (exercises and sets). Among the components above, we’re only going to update the ConnectedFlatList (app/components/ConnectedFlatList/ConnectedFlatList.js). As it is right now, it won’t really render anything. We have to turn it into a “connected” component so it will automatically re-render once the relevant data in the store is updated. We will be updating the app/screens/LogWorkout.js file later because that’s where we need to link everything up. Dispatch an action for adding a new exercise to the store when the user adds a new exercise. Dispatch an action for adding a new set to the store when the user adds a new set. Subscribe user to their own channel so they can emit client events. Subscribe to another user so they can listen for client events emitted by that user. Emit a client event on the channel when a new exercise or set is added by the user. Listen for client events so the tracking tabs UI is synced to that of the user being followed. Let’s make this as hands-on as possible. I’ll first mention what needs to be done so you can try on your own, and then you can peak at the code either here or in the GitHub repo if you’re not sure what to do. I’ve also added “todo” comments in the starter code as a guide on where you should put a specific code. Feel free to browse around the code whenever you see “our task is to…” or “next, we need to..” as that’s the cue for when we’ll start adding the code. Try to figure out on your own first before you proceed. The username is generated, and it can be copied to clipboard, but that’s it. Nothing you can really do in this tab (logging tab) right now. Our first task is to figure out how to make the add exercise modal visible so we can enter the exercise we want to add. If the rest of the app’s UI isn’t affected if the value of a specific piece of data is updated, then it’s not an action. Entering the name of the exercise. Entering the weight of a set. Both instances don’t update the app’s UI in a way that affects the whole app, so the state for those can be managed within the component level. Note that the addedExercise, addedSet, and incrementedSet functions have a user parameter which is set to me by default. This allows us to specify which specific app state will the data go. The value of this parameter can either be me or others. me is for the data displayed in the logging tab, while others is for the data displayed on the tracking tab. Exercise reducer (ExerciseReducer.js) - for exercise-related data. Set reducer (SetReducer.js) - for set-related data. UI reducer (UIReducer.js) - for UI-related data. These are usually booleans which hide or show what is seen on the screen (for example, modals and progress loaders). When it comes to figuring out which reducers to create, anything really goes if you’re only working on a throw-away project to learn a specific technology. But be sure to read about Redux best practices when working in a production app. Create an app/reducers folder and create the files mentioned above inside it. From the code above, the first step is to define the INITIAL_STATE. Note that this isn’t the initial value for the whole app state. This should only be for the specific data modified by this reducer. In this case, it’s only the exercises (the exercises logged by the current user), and others_exercises (the exercises logged by the user followed by the current user). Based on the user passed from the action, we get and re-create either the exercises or others_exercises array. Take note of the word “re-create” as we’re not really supposed to modify the state directly, we only replace it with a different value. Redux handles the calculation needed to determine whether the UI should be re-rendered or not. And if you modify the state directly, then it won’t be ensured that that process will work correctly. That’s why we’re using the spread syntax and concat method to avoid updating the state directly. Now that we’ve defined our actions, action creators, and reducers, the next step is to link the LogWorkout screen to the store. In the code above, createStore is used for creating the store. Consider the store as the global app state, while the Provider is a helper component that allows us to pass down the store to the component level. This gives us the ability to dispatch actions within this component and allow its child components to also connect to the store. When the button is clicked, it should execute the exercise reducer and the app’s state will be modified. Currently, the add exercise modal isn’t really aware of the changes that happen in the store yet, so it won’t really become visible when the button is clicked. The next step is to make the add exercise modal into a connected component. That way, it will become aware of the state changes so it can re-render itself when a data it depends on changes. Once that’s done, clicking on the button in the header should make the add exercise modal visible. This is why we still had to use this.props.ui.addExerciseModalIsOpen. Once that’s done, a new exercise should be added to the store every time you click on the add button in the add exercise modal. The modal should also automatically close after that. Now that we’ve added the code for creating a new exercise, the next step is to show the exercises that were added. That’s the job of the ConnectedFlatList component. Take note of the extraData prop that we’ve supplied for the FlatList. We’ve supplied sets to it because the sets data isn’t nested under the exercises array. That means that if we add a new set or increment an existing one, this FlatList won’t really get re-rendered. Supplying sets as an extraData allows us to re-render the main FlatList when the sets data is updated. Once that’s done, you should now see the exercises being listed as you add them through the add exercise modal. 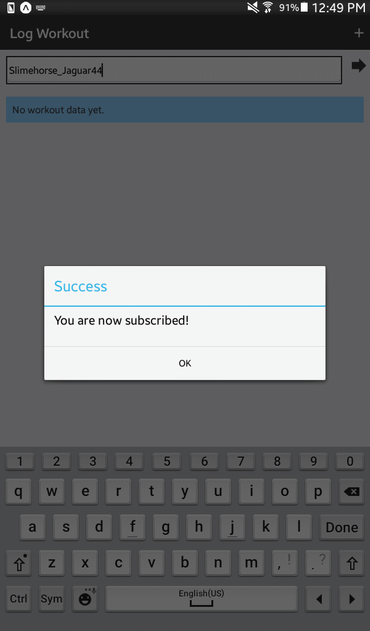 Now that we can add and show exercises, the next step is to show the add set modal. When the plus button to the right of the exercise name is clicked, it should show the add set modal. To implement that, we need to dispatch the action for toggling the visibility of the add set modal. Note that aside from the modalToggled action, we also have setExercise. This is for updating the value of the current_exercise property in the UI reducer so that by the time the user hits the button for adding the set, we can extract this value from the props and supply it as one of the properties for the set to be created. Once that’s done, the add set modal should become visible when the plus button to the right of the exercise name is clicked. Note that the value of this.props.users in the code above is passed as a prop via the standard means (through the component). This is used to determine which specific set data to use (the current user or the user they’re following). The l_key is used as the value for the listKey for the FlatList that will contain each set. We need to supply this because we’re nesting a FlatList within a FlatList. The listKey prop allows React to differentiate between sibling flatlists. At this point, you should be able to see the sets being listed below a specific exercise when you add them. The final thing we need to implement when it comes to the logging functionality is incrementing the value of a specific set. We called it “increment set”, but what we really want to do is to increment the number of reps for a specific set. At this point, clicking on a set should increment the number inside it. Now we’re ready to implement the tracking tab. The codes we’ve added above should be fairly easy to understand. We’re emitting a client event via the channel prop we’ve passed from the LogWorkout screen. The trigger method accepts the name of the event as its first argument, and an object containing the data we want to emit as its second. Note that client events should always be prefixed with client-. This allows Pusher to determine that this event is sent from the client. Now that we’ve added all of the relevant code, the app should work after we’ve added all the config and linked it to its server component. 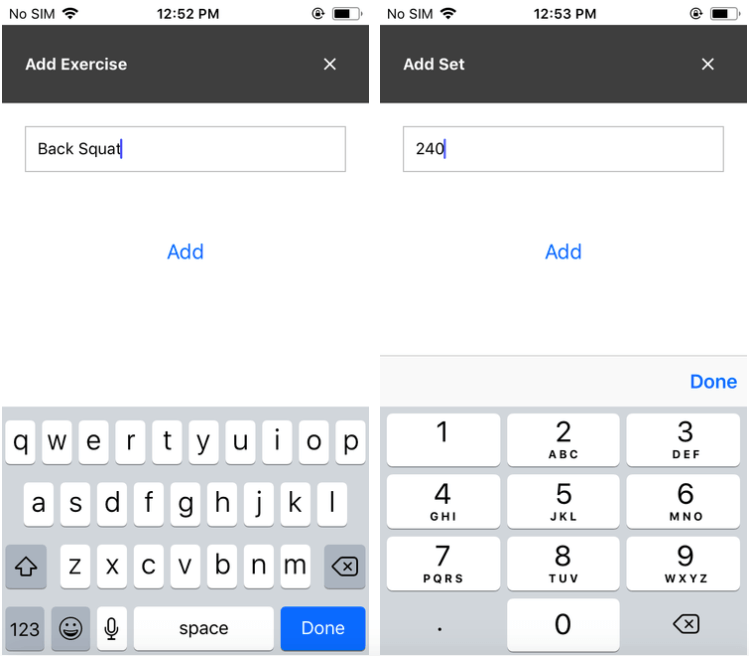 In this tutorial, you learned how to use Pusher within a React Native app to create a realtime workout tracking app. Along the way, you’ve solidified your experience with basic Redux concepts and Pusher Channels.